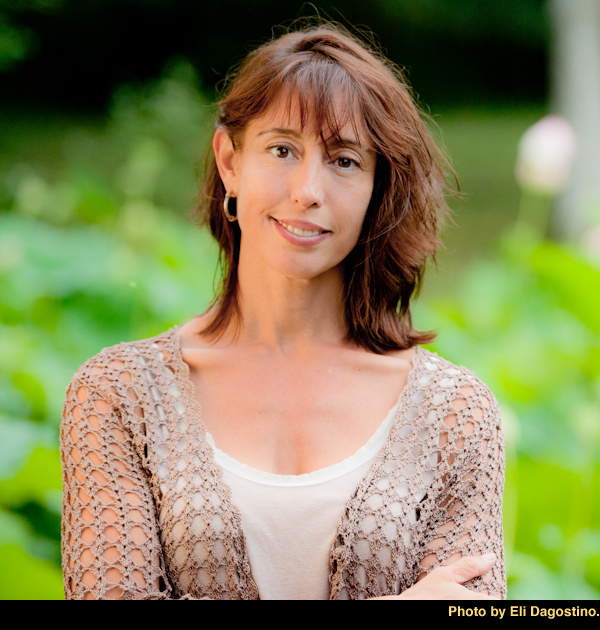 I am very pleased to welcome author Nicole Galland to Passages to the Past today to talk about her novel I, Iago! 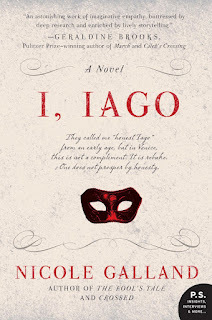 Thanks to HarperCollins I have one copy of I, Iago up for grabs, so be sure to enter the giveaway at the bottom of this post. My novel I, Iago is inspired by Shakespeare’s masterpiece Othello. The play features two married couples. In the novel, we watch each couple meet, fall in love, and marry. Without giving much away: in Othello, Ensign Iago is angry at General Othello for not promoting him to lieutenant. To get back at him, Iago decides to convince Othello that his bride, Desdemona, is having an affair. (If this sounds to you like an extreme reaction, you’re in good company.) One of Iago’s tools of deception is Desdemona’s handkerchief. Iago’s wife Emilia, who is Desdemona’s attendant, pinches it (at Iago’s request) and gives it to Iago, who plants it on Desdemona’s supposed paramour. Chaos ensues. Eventually Emilia realizes the role the handkerchief has played in all the mayhem, and calls her husband to account, mortified at her own involvement. Of these two couples, one of them – Desdemona and Othello – is pretty familiar by name, even to those with little knowledge of Shakespeare. They are famously passionate and impetuous. In the play, they have just eloped in defiance of Desdemona’s patrician father; they pet in front of the population of Cyprus (including the soldiers Othello commands). In almost every scene together, the two are in physical contact; even when they aren’t, Othello’s words have a physical effect on Desdemona. The nature of their relationship is clear at every moment. Remember, Shakespeare wrote his plays for actors, not for readers. When actors playing these two characters walk into the rehearsal room for the first time, they already have a sense of how they’ll be playing the scenes. In contrast, the other couple’s “vibe” is downright murky. Iago and Emilia have been married longer than their respective bosses. But on-stage they speak directly only occasionally; and they have just one brief (but pivotal) scene alone together. And yet, if Othello and Desdemona’s eloping sets the story in motion, it is Iago and Emilia’s relationship that keeps the plot moving – and then short-circuits it. Theirs may be the most underwritten marriage in history. Unlike the actors playing Othello and Desdemona, whoever plays Iago and Emilia are likely to show up for rehearsal with no clear idea what kind of matrimony they are in for. Their relationship can be interpreted any number of ways. Even if you’re not the sort to step foot in a theatre, you’ll find, even on Youtube clips, that every movie of Othello has a different slant on the Iago-Emilia marriage. For the sake of maximizing Iago’s villainy, most depictions are not positive. To name a few: They are a long-married couple, resigned to the habit of bickering; or, the adoring Emilia longs to please her strangely distracted husband, who has recently grown grumpy; or, theirs is the classic abusive marriage – Iago treats Emilia snidely even in public, and she, in a cloud of confusion that is common to battered spouses, is desperate to please him and obeys without question because she is too cowed to do otherwise. When I became obsessed with understanding Iago (after directing a staged reading of the play), I realized that most of all I had to understand his relationship with his wife. I disagreed with all these negative interpretations. I am not alone in that; I’d also seen the couple played as if they are bantering, not bickering. That, to me, was not only the most attractive, but the most compelling, way to go. So I dug into the scenes, lines by line, word by word, that make some (usually male) scholars feel Iago bullies his wife. Chief among these is part of a scene that is usually cut in performance: As all the characters await Othello’s arrival in Cyprus, Iago makes cheeky comments to and about both Emilia and Desdemona, to the point that another character intervenes, apologizing to Desdemona for Iago’s rudeness. But Desdemona seems charmed by it, and Emilia even eggs him on! I suppose his impudence could be interpreted as misogyny – but given how the ladies respond to it, it could just as easily be seen as playful banter. To suggest that joshing a woman is misogynistic is frankly, to me, somewhat sexist in itself. Iago may dish it out at times, but Emilia can dish it back; she teases him as much as he teases her, and near the end of the play, she tells Desdemona how far she’d go to make her husband king of the world if she could (she’d go pretty far). All the other scenes that could suggest a bad marriage between them can just as easily been read – and more importantly, performed – as a lively marriage between two lively personalities. It’s fun in theatre to be able to interpret one scene in different ways, but it is more satisfying to me (perhaps I’m too controlling?) to cement just one particular version by fleshing it out on the page. I’m not saying my interpretation of Iago and Emilia is the best one, or the only one. But it’s one that I believe in and love a lot, both for itself specifically and for what it says about human nature generally. There are few things more satisfying in any kind of story – book, movie, or play – than a spirited relationship between two strong characters. If you ever have the opportunity to see Othello, I hope you are treated to an Emilia and a Iago who are a marriage of true minds, as I believe I’ve made them in I, Iago. From earliest childhood, the precocious boy called Iago had inconvenient tendencies toward honesty—a failing that made him an embarrassment to his family and an outcast in the corrupt culture of glittering Renaissance Venice. Embracing military life as an antidote to the frippery of Venetian society, Iago won the love of the beautiful Emilia and the regard of Venice's revered General Othello. After years of abuse and rejection, Iago was poised to achieve everything he had ever fought for and dreamed of . . . But a cascade of unexpected deceptions propels him on a catastrophic quest for righteous vengeance, contorting his moral compass until he has betrayed his closest friends and family, and sealed his own fate as one of the most notorious villains of all time. Inspired by William Shakespeare's classic tragedy Othello—a timeless tale of friendship and treachery, love and jealousy—Galland's I, Iago sheds fascinating new light on a complex soul, and on the conditions and fateful events that helped to create a monster. For more information on Nicole Galland and her novels, please visit her WEBSITE. - Giveaway ends on May 5th. Would love ti read thus book..will tweet at rhondareads am twitter follower. This was a very interesting post and makes me anxious to read I, Iago. Thanks for the giveaway. Thanks for the chance to win. It sounds like a very interesting book. This sounds like a perfect book for my upcoming vacation - thanks for the opportunity! Thanks for this chance to win. I've been eying this book. My email address is readhandedlibrarian(at)gmail(dot)com. I'm a GFC follower (Julie @ Read Handed) and I follow you on Twitter (Read_Handed). Thanks! I never considered Iago's background. Love this idea. Thanks for the chance to win. I'm a follower. As a long time Shakespeare fan I found the character of Iago fascinating. Now we can read HIS side of the story. What's his excuse for his almost pitiable hate! I have been a long time follower my email, twitter (@softfuzzysweatr), facebook and GFC. I tweeted this giveaway and FBed it too. Please enter me--need to win someting again. Jumping up and down! Sounds great! I love the idea of delving into one of Shakespeare's most enigmatic characters! Thanks so much for the giveaway! How fascinating! I am not very familiar with Othello but I love the idea of playing around with the character's true intentions and personalities to discover a different spin on a well known set of characters. Thanks for the chance to win a copy! Love to get my hands on this one. Timely giveaway too. Shakespeare's birthday was April 23rd. So those are my lucky 13 entries. Hello little book, come to papa. What a delight it is to read these comments! I don't need one since the manuscript is on my computer, but I'm absolutely tickled by people's interest. I wrote the book to be equally engaging to those who do know Shakespeare's work and those who don't, so I'm especially pleased to see interest from both camps. Thanks again, Amy, for hosting this! Wow. I don't remember as many details of Othello as I should, but I'm certain I didn't grant enough consideration to Iago and this book sounds absolutely fascinating! I have been a huge Nicole Galland fan and have been eagerly awaiting her next novel for many years! I was beginning to think she wouldn't release anything new. I feel like her novels are unique in that the main character is always the man and men's POV seem rare in historical fiction (or at least the historical fiction I read!). please add +5 for being a follower! I don't think my post went through so I am trying again. I loved both Crossed and A Fool's Tale. I ant wait to read the new book. Wonderful guest post! Nicole's approach to Iago and Emilia sounds very intriguing. (I can't help but picture Iago as Kenneth Branagh, who portrayed him in one of the film adaptations. LOL) Thanks for the giveaway! Nicole: I read and savored every word of your explanation of the "mental" relationship between Iago and Emilia. I found it incredibly enlightening how you compared his treatment of her as that of a battered spouse. I wonder how much of that was common during that time period as men were touted as "superior" to women. Your intense study, interpretation and explanation of Othello is mesmerizing. Thank you so much for writing it. 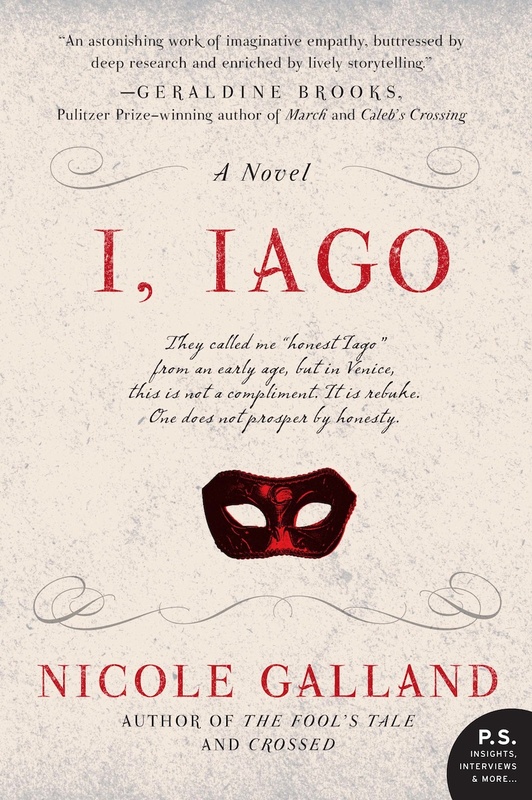 I would so love to read, "I, Iago." You know, it is funny, I read Othello a few years ago, but don't remember Iago having a wife at all! Oops! I will have to take a look at it again!